Smaller homes are gaining ground against McMansions. Take a drive to the edge of Madison, or past the city limits, and you can't help but see them: adrift in a stretch of flat, unlandscaped soil, springing up in subdivisions. Gigantic houses. Often with areas in excess of 5,000 square feet, these homes are prized by the Parade of Homes crew but referred to by critics as "starter castles" or "McMansions." But what if you're in the market to build a brand-new home and aren't interested in his-and-hers bathrooms, a media room, an exercise center and a great room with cantilevered ceiling? Well, for starters, you'd be in good company. Asked about larger suburban homes, local designer Jill Kessenich of Architecture Network admits, "I'm starting to encounter more and more dissatisfaction." Andrea Hoerr and her husband, Doug, knew in advance they didn't want a large home. Working with a design from Lou Host-Jablonski of Design Coalition, the couple's house, located in rural Barneveld and due to be completed in October, weighs in at around 2,000 square feet. "You don't need a lot of stuff" says Hoerr. "You don't need to impress the neighbors. We wanted to impress ourselves, not anyone else. The Not So Big House takes as one of its starting points the simplification ethos of the late 1990s. 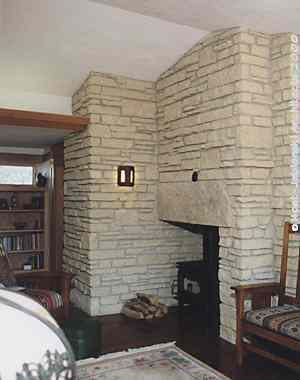 Susanka also incorporated and esthetic handed down from Frank Lloyd Wright, succinctly stated as "bigger isn't necessarily better." The Not Big House advocates designing houses for how people actually live, eliminating traditions such as formal living and dining rooms. The photos in the coffee-table book depict rooms, many designed by Susanka herself, that are at once cozy and open. Wooden trim is abundant; much of the design work is influenced by the Arts and Crafts movement. Kessenich takes her cue from Susanka in arguing that dissatisfaction with big houses stems from design flaws implicit in the scale itself. "I don't think those houses are very livable," says Kessenich. "I think they are usually fairly cold in character: I don't think a great room with a 12 or 16 foot vaulted ceiling is necessarily a comfortable space to live in. Maybe it's grand, and it's impressive, but I don't think it lives very comfortable." Just because a house is smaller doesn't mean it will necessarily be cheaper to build, however. Both Susanka and Kessenich advocate making up for lost size by using money for details. Kessenich encourages "hardwood floors...good quality, real wood windows; decent-sized casings; real wood doors; six or eight-inch tall baseboards, rather than just the 3-1/2 inch ranch molding; maybe ceramic mosaic tiles floors in the bathroom." Kessenich cautions that she isn't describing mansion-level details: "We're not talking about crystal chandeliers or marble flooring in the vestibule...just good-quality materials, proportioned correctly, proportioned the way they were build a long time ago." Host-Jablonski believes that increasing levels of affluence in Madison have changed the way consumers are looking at new construction. "They're able to afford a better house." says Host-Jablonski of many in the new home market. "People are increasingly aware that quality isn't just about size. It's about durability, quality of appliances, esthetics. " He's heartened by an increasing awareness of the important of design nationwide. However, he adds, this realization has been "very slow." Even if builders have the money to pay for good design and quality materials, these elements are not always so popular with banks. In lending money for new home construction, banks generally use a cost-estimation formula based on square footage, figuring that building the house should cost roughly $85.00 per square foot. Another obstacle is the often developers require new houses to meet a minimum size standard, usually somewhere between 2,500 and 4500 square feet. Andrea Hoerr said she and her husband knew from the start they wanted a home that was "cozy, comfortable and incorporated good design." They also wanted a house says Hoerr, that had low impact on the landscape, visually and ecologically." The couple selected a passive solar design and used local materials, including stones from their own site. They plan to do prairie and savanna restoration on the land surrounding the house. Host-Jablonski says he is seeing many consumers who want houses that utilize "green" technologies. People are also interested in even smaller houses, under 1500 square feet. Many of these homes are designed as a starter for first-time buyers. Host-Jablonski's firm, Design Coalition, is currently working on a project with Madison Area Community Land Trust to build 1,350 square foot homes, with twin goals of affordability and environmentally conscious construction practices. According to Host-Jablonski, defining a 2,000-square-foot home as small is a recent phenomenon: "A starter home at 1,300 or 1,400 square feet was typical after World War II. It wasn't uncommon to see 600 and 800 square-foot homes. They had tight quarters, but they were sufficient." What are potential not-so-big home builders to do, whether they want a small, basic starter home or a lavishly detailed Craftsman-inspired masterpiece? "Start with a plan book ," advises Kessenich, who has co-authored one with architect Tim Ashmore. Kessenich also suggests that people who want to build a small house but have limited funds for details finish some of the work themselves, such as painting or tiling. However, she cautions, "Banks don't really like that, because they want a completed house. That's what they're insuring--if people default on their loans, they'll have a completed house to put on the market." But there is some good news, both in terms of homeowners doing work themselves and on the dollar-per-square-foot formula: "Some places are being a little more flexible and creative." Susanka writes of a conversation with a banker who was at first skeptical when she proposed her own home-building plans to him: "But as I described to him my frustration with designing large houses with rarely used formal spaces, and my vision to put forward a different home model into the market-place, his demeanor completely changed. Suddenly he was telling us about his own house, a suburban Colonial, and admitting that in 25 years his family had never sat in the living room. They lived in their family room. The banker, who at first appeared to be our biggest obstacle, became our strongest advocate." This type of ideological conversion seems common in the smaller-home movement--for that is what it is, in some circles: a movement. For Susanka, as well as for other architects and planners across the country, it's a political and spiritual quest to return Americans to surroundings that are comfortable, practical, cozy and nurturing. A small house can have big implications.